Images of Czech police officers writing numbers on the hands of migrants are an uncomfortable reminder of a different event and a different era. But the Czech authorities appeared totally unaware of the unfortunate visual connotations with the Holocaust, when prisoners at Auschwitz were systematically tattooed with serial numbers. The Foreigners' Police said the priority in dealing with the 200 migrants at Breclav railway station, in the South Moravian region, was identifying them and trying to keep family members together. This, said a spokeswoman, was a difficult task when many had no documents and did not speak English; hence the numbers in felt-tip pen on their arms. "These are awful images," said Hana Frankova, head of the legal department of a Czech NGO called Organisation for Aid to Refugees. "It's absolutely against the provisions of the Refugees Convention, that asks signatories not to punish refugees who came without documentation," she told the BBC, adding that there was an established procedure for identifying asylum seekers. Czech authorities say the migrants are now being housed in several police gymnasiums until it can be established whether they have already requested asylum. If they have not, under the Dublin Regulation the Czechs are authorised to return them to the first EU country they were registered in. But in this case, that is often Hungary - which is itself already struggling to cope. So instead they will likely be detained in prison-like facilities for up to six weeks, before being let go - probably to continue their journey to Germany. Some observers, however, question why they are being detained here at all. Almost certainly they do not want to apply for asylum in the Czech Republic, which has so far received just 884 asylum requests this year. Instead they want to go to Germany, which - at least as far as the Syrians are concerned - will welcome them with open arms. So why lock them up at the expense of the Czech taxpayer? They will be presented with a bill at the end of their six-week incarceration; few, of course, have the money to pay it. "The Czech authorities are presenting them as criminals, and it resonates well with the public when they are detained," Hana Frankova told the BBC. That is obviously not the official explanation. 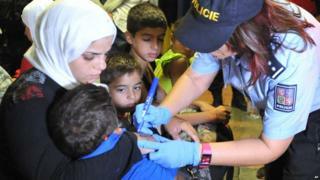 The authorities say they are detained because they arrived on Czech soil without documentation. But the public mood is hardening; a petition is already circulating in Breclav in protest at a tent city being erected in the suburbs to house migrants arrested at the station. And that hostility is echoed on a national level. A new poll released on Wednesday suggested that 94% of Czechs believed the EU should return refugees to where they came from, 32% without helping them at all.